Family owned luncheonette and old-fashioned soda fountain dishing up American classics and ice cream treats. Burger Night Every Monday All Summer! Every Friday Night is Sundae Night! Sip'n Soda was founded in 1958 by the Parash family. William, Nicoletta, Paul, and Jim worked hard to establish Sip'n Soda as the Southampton landmark it is today. The Parash family has been involved in the luncheonette business for over 75 years. William opened the Oyster Bay Candy Kitchen in 1918. Later in 1925, he and Nicoletta opened the Bridgehampton Candy Kitchen. They lived in an apartment above the restaurant where Jim and Paul were born. The Hamptons were pretty quiet back then, so William decided to move the family to Jacksonville, Florida. After a few years, the Parash's decided to move back to Long Island. They settled in Mattituck and opened the Paradise Sweet Shop. Paul & Jim finished high school, then went on to college and the armed forces, while their parents ran the restaurant. The family decided to move to Southampton in 1958 and opened Sip'n Soda. Paul and Jim continued to run the luncheonette after their parents passed, and were joined by Paul's son, Mark in 1992. 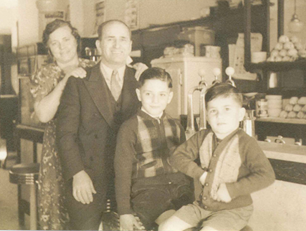 The Parash family is very proud that Sip'n Soda is till going strong after three generations.